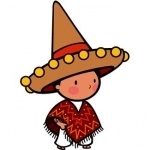 More then 170 free Spanish eBooks for children. Most of them are beautifully illustrated. The International Children's Digital Library is a project of the ICDL Foundation in collaboration with the University of Maryland's Human-Computer Interaction Lab.